HALO is our male. He is a beautiful representative of the breed. Halo's weight is 120lbs he is a very big boy. 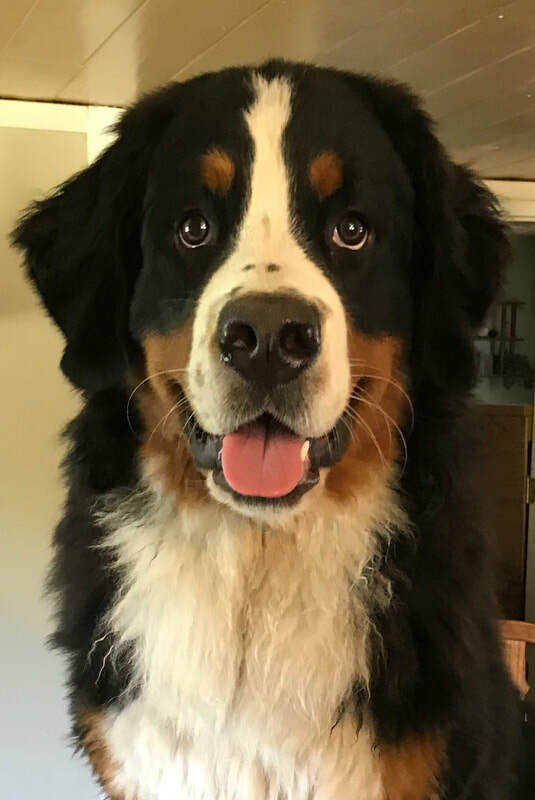 He will definitely check you out, but be prepared for a big berner eye to eye hug once you pass inspection. He is in obedience classes now and doing great, we hope to get our k9 Good Citizens Cert. soon. Halo's grandparents are 10 and doing great. Holo's Father is Ofa Excellent. HOPE Is the first Bernese we brought in to our family. What a life changing event. She is the most loving animal I have ever been around. At 102 lbs she is still a lap dog. She falls asleep every night in between us on the loveseat with half her body on the seat and half her body on one of us. Our plans are to have Hope get her K-9 Good Citizen. Hope is now retired and living the good life, she is now a nanny to our future litters. HEAVEN Is so eager to please, she is mama's girl. Heaven is 106lbs. As with all berners she can't wait for each new day. She has everyone tired out. Play time is all the time, except for the occasional nap to recharge. Heaven is also in advanced obedience classes, and she will be getting her k9 Good Citizens Cert. soon. Heaven is now Retired. ANGEL She is so kind and loving, Angel is the reason we started the dogs in obedience class when you looked into her eyes you could see how bad she wanted to learn. She is 105lbs and has strong European bloodlines ( Belgium ) her parents are OFA Good. Angel is now Retired. STELLA is a very loving and kind 85lb girl. She is CHIC certified with European Bloodlines and champion bloodlines. She comes from 3 generations of health tested parents. Stella is a daddy's girl she is a very laid back. Stella is so smart she watches everything. Stella's grandparents are 11 and doing great. Stella's grandfather at age 10 1/2 just sired a litter. GRACE/TINA is a very smart and loving 90 lb girl. She came from Lithuania and her father is champion of Poland and Lithuania 4x best of breed and Grace's mom scored excellence. Both parents OFA- excellent, Eyes- clear, DM-0/1, PRA- free, IPO- b, mental test passed, ZVOP. GABBY IS A SOCIAL BUTTERFLY AND A MOTHER HEN, SHE HAS TO CHECK ON EVERYONE BEFORE SHE GOES TO BED TO MAKE SURE EVERYONE IS ASLEEP BEFORE SHE WILL FALL ASLEEP FOR THE NIGHT. GABBY PLAYS AND CLEANS ALL OF OUR YOUNGER DOGS LIKE SHE IS THEIR MOTHER. GABBY'S PEDIGREE HAS MANY MULTIPLE CHAMPIONS AND HER FAMILIES PEDIGREE OF HIPS RANGE FROM FAIR TO EXCELLENT. IGGY/ENIGMA Is a beautiful 110lb girl. Iggy comes to us from Russia her father is a champion as well as her grandparents on both sides. Iggy's pedigree for 5 generations back have all been health tested and passed. Iggy loves to play and have fun and if you are willing to rub her belly all day she would love that. IVAN IS OUR BEAUTIFUL 115LB MALE FROM RUSSIA. HE IS SO GENTAL AND KIND. IVAN LOVES TO SIT ON A CHAIR AT THE KITCHEN TABLE IF YOU WILL LET HIM. IVAN LIKES TO PLAY OUTSIDE WITH THE GIRLS AND HE IS VERY GENTEL WITH THEM. IVAN COMES FROM HEALTH TESTED PEDIGREE WITH MANY CHAMPIONS .